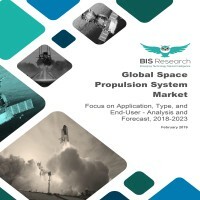 According to BIS Research analysis, the global space propulsion system market generated $5.63 billion in 2018 and is estimated to grow at a CAGR of 13.06% during 2018-2023. The space propulsion system market is expected to witness a high growth rate owing to significant increase in satellites and launch vehicle manufacturing. Recent innovations in components have enabled the space propulsion system technology to reach to a wider segment of consumers in the industry. Apart from this, significant investment in development of cost-effective and efficient The space propulsion system market is expected to witness a high growth rate owing to significant increase in satellites and launch vehicle manufacturing. Recent innovations in components have enabled the space propulsion system technology to reach to a wider segment of consumers in the industry. Apart from this, significant investment in development of cost-effective and efficient propulsion systems is a prominent factor leveraging growth in the market. For instance, NASA awarded contracts to six companies including SSL, Blue Origin, and Aerojet Rocketdyne, among others, with an aggregate worth of $44 million, to develop advanced propulsion system, in August 2018. Moreover, companies are developing various forms of emerging technologies, such as air breathing propulsion system, electric propulsion system, and reusable propulsion system, among others, which is expected to propel the growth in the global space propulsion system market. In terms of revenue, the global space propulsion system market generated a revenue of $5.63 billion in the year 2018. The preceding figure illustrates the increasing number of space propulsion systems and revenue generation of the global space propulsion system market in 2018 and in the forecast period, 2018-2023. The market reported a revenue of $5.63 billion in 2018 and is expected to grow at a significant CAGR during the forecast period 2018-2023. The global space propulsion system market has been segmented into two end-users: commercial and government and military. The government and military end-user segment acquired the largest share in 2018; however, commercial end-user segment is expected to grow at the highest CAGR during the forecast period, 2018-2023. In addition, the global space propulsion system market is also classified depending upon the application i.e. launch vehicle and satellite. The launch vehicle segment had the highest market penetration in 2018. However, the satellite segment is estimated to grow at the highest CAGR during the forecast period, 2018-2023.